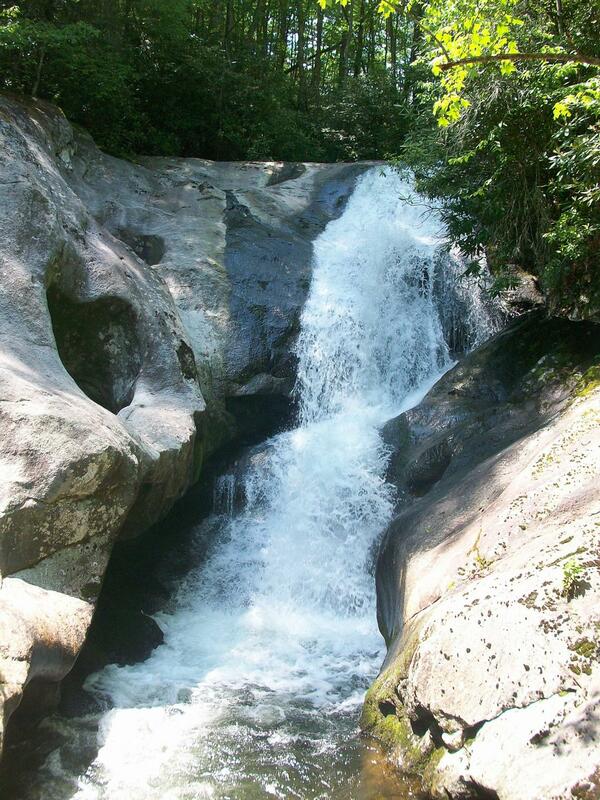 This waterfall is a narrow tumble and cascade into a deep trough that opens up and spills out into a deep pool (a fantastic swimming hole when the water isn't too high). The waterfall isn't particularly high, but for scenic beauty, its wilderness-like setting more than makes up for what it lacks in height. There are some cool rock formations around the falls: an overhanging bluff on the right, and a couple of potholes on the left (looking up). One of the potholes has tunneled all the way down through the rock to the base of the falls, giving the falls its alternate, old name of "Hole in the Wall". There are nice areas across the pool for hanging out and enjoying the view. From the Wilson Creek Visitor Center at 7805 Brown Mountain Beach Rd., go 3.1 miles North to NC. route 90 (one of NC's last unpaved state roads) and turn left. Go 1.8 miles and turn left on FS 464 (Pineola Rd.). Go about 3.6 miles uphill and the trailhead for trail #266A is on the left. Park there. Though the hike is quite moderate overall, there are two main challenges to contend with: the wade across North Harper Creek, and a steep scramble down to the base of the falls at the end. Take trail #266A downhill. The trail is generally narrow but well maintained and not steep. It does have a few places where the slope drops off steeply below, so it's probably not for small children. It crosses a few small side streams. The trail ends at the N. Harper Creek Trail and the creek is just ahead; turn left, downstream. The trail crosses the creek about 1/4 mile down - it will be a wade unless there is a drought, but it's not much above knee deep. Pick up the trail again on the other side and continue downstream for about 1/2 mile more. This is an old logging railroad grade, as proven by an old photo showing a locomotive above the falls on this side of the creek. There will be some rock bluffs on your right, and then you will pass some smaller cascades. Then the waterfall appears on your left. The trees open up and you can get a view from the top of the falls on the open rock (if it is not wet and you stay well back from the steeper parts). Some people scoot down the rock here to the base, but don't do that - go back to the trail and continue downhill, passing by a wet area on the left. You'll come to another rocky drainage heading downhill toward the creek; descend here. Though safer than the rocks beside the falls, it's still a steep, slippery scramble down to the flat area at the base of the falls, and it's the hardest part of the hike.